Intramembrane proteases cleave their substrates within the plane of the membrane. 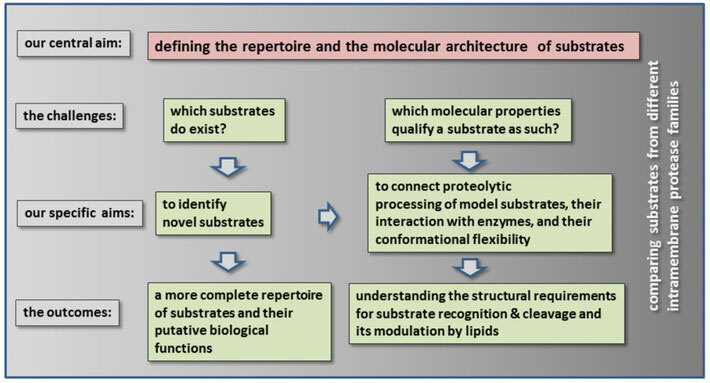 Thereby, these unusual proteases affect a wide range of important biological functions and are implicated in several severe diseases including Alzheimer´s disease, the most common neurodegenerative disease.However, despite of more than a decade of research, we neither know the full repertoire of substrates and their functions nor do we understand the molecular properties that qualify a substrate as such. It is thus unclear what distinguishes substrates from non-substrates in structural terms. On the one hand, the transmembrane domains of known substrates exhibit a tremendous diversity of primary structures. On the other hand, only a fraction of single-span proteins are known as substrates and point mutations within them can strongly interfere with their proteolysis.This puzzling discrepancy between seemingly promiscuous and clearly sequence-specific proteolysis of substrates indicates that their transmembrane domains share structural features that allow for specific recognition and cleavage by a given protease.